Maha Shivaratri is an annual festival dedicated to the god Siva and is celebrated mainly at midnight. Siva Purana, Skanda Purana, Linga Purana and Padma Purana narrate stories about how on this day, Siva drank poisonous negativity to protect the world on this evening. Later he fell unconscious and Sakti came in the form of Tara to breastfeed and bring him back to consciousness. Later, gods performed wedding of Siva and Parvati (Sakti) again to celebrate the comeback of Siva on this midnight. This is the night when Siva and Sakti unite as ArdhaNaareeshwara and perform the heavenly dance of creation, preservation and destruction. This festival’s main significance is overcoming darkness, negativity and ignorance in life and the world. Staying awake throughout the night, fasting, doing Yoga, and meditating on ethics and virtues such as self-restraint, honesty, noninjury to others, forgiveness are paths for discovering Siva within ourselves. In Kashmir Shaivism, the festival is called Har-ratri or phonetically simpler Haerath or Herath. Lord Siva is a cosmic allegory, but not a human form, who was a yogi or beggar. The two hemispheres of the brain are in Yogic terms, controlled by the energy constructs we call Siva and Sakti. Left side of brain controls rational and logical thinking. It is deductive, planning and hypothesizing. These are supposed to be masculine vibrations, in the sense of Yang, not gender roles. Right side of the brain is intuition, creativity, instinct, feeling, the sense of joy, wonder and the right side of the human frame. These are the feminine vibrations in the sense of Yin. In Vedic Astrology, Sun controls the right eye, and Moon controls the left. Moon controls emotion and hence Sakti controls it and the left eye. Siva wears the moon on his head (Chandrasekhara) to symbolize his complete integration of emotions and to stress that his responses come from awareness, not instinct. Right nostril connects to the Pingala nadi or solar channel and is fiery, energetic, action oriented and masculine. These breaths flow like fire, generating heat and energy for action. That is why Yoga suggests us to breathe through left nostril to cool the body. Erect serpent at the center of the brows is the fully active Ajna (आज्ञा) chakra. Here, Ida and Pingala cross each other forming a grand marma or spiritual junction of power. 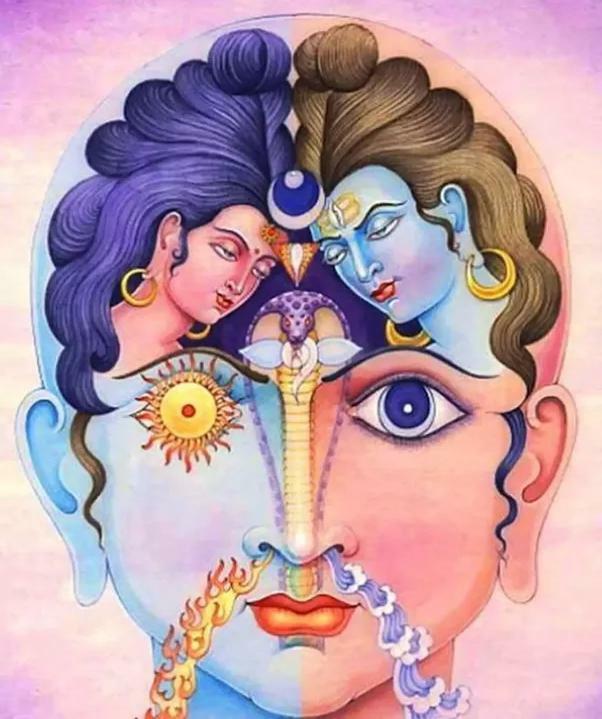 Inverted triangle at the forehead is the spiritual Yoni, the Matrix of creation of generation, distinct from the lower yoni that is controlled by the svadhishtan chakra and is the Eros impulse. When your kundalini rises to this point you can send a surge of energy into the world and what you wish is manifested. Siva is a cosmic force. He is not a human to have a body. To symbolize the unfathomable, the infinite divinity, and to make it comprehensible for young people, for children and others, they made a form. Siva is a principle (Tattva) from where everything has come, everything is sustained in it, and everything dissolves into it. Siva is the space, it is the consciousness. Siva is the soul and without Sakti, it is Sava (corpse). 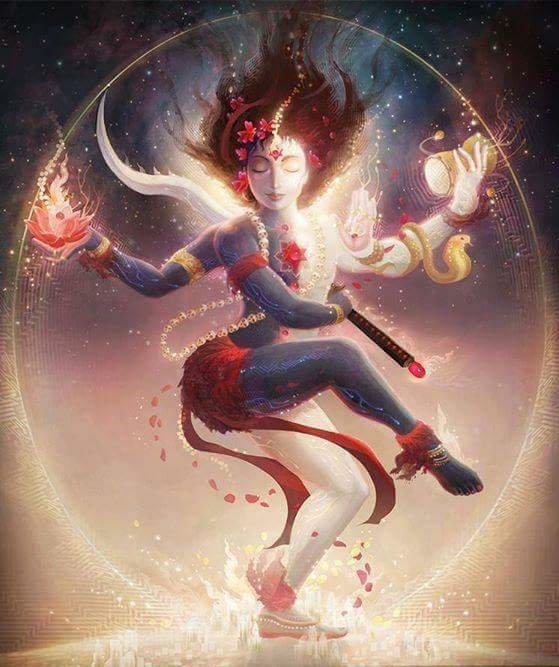 Siva is the soul and Sakti is the kundalini resting in the body. The union of Siva-Sakti, which is narrated as their marriage, is actually dissolving of mind into soul, which is equal to attaining bliss in meditation. In order to achieve it, fasting for entire day and staying awake throughout the night is recommended. This is the cosmic dance of ArdhaNaareeswara, which a yogi can experience in his body too. In the Samudra Manthan, Devas are the energies in our body and demons are the bad qualities such as ego, pride, lethargy etc. With fasting, meditation, we can rise above theese good and bad of the body. Jagaran or staying awake, actually means to stay spiritually awake in meditation. But to start, one needs to be physically awake and one cannot meditate with full stomach. So, fasting etc rules have been made. Why only this night is chosen for fasting and Jagaran ? Today, Sun and Moon comes close to each other in Capricorn (Makara Rasi) and Moon crosses Sun in next 2 days. Makara Rasi is Karma Sthana (10th house) of the zodiac, which is controlled by Saturn and is ideal for spiritual practices. So, this is when Siva tattva and Sakti tattva unite. 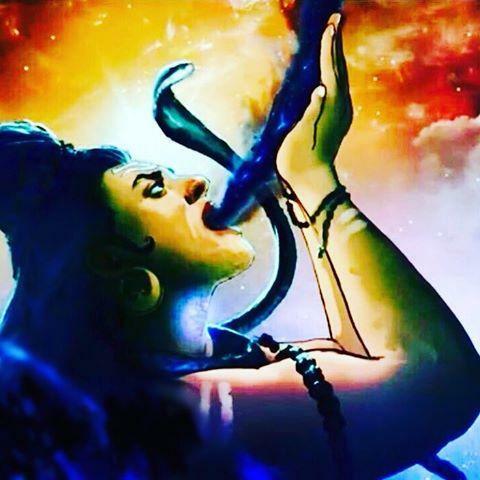 Jagran in Sivaratri, which is staying awake all night is not just forcing oneself to be awake by sing devotional songs, watching midnight movies or gossipping. It is about being consciously aware of the inner rest that sleep brings everyday. When you surpass a certain layer of sleep, samadhi happens. Samadhi is Siva Sayujya, the presence of Siva, a state of deep rest with alertness, which brings freedom from all identities. Siva Lingam is not just a stone, but symbol of creation. Siva is described to be in pre-atomic stage (anupoorva sthiti), i.e in form of electrons which move in sine wave shape. 3 parts of Siva Lingam scientific meaning and significance. Tryambakam: The three eyed lord (Shiva) who sees what we can see but who also sees what we can not see. Hence 3 eyed. Urvarukam iva bandhanaan mrityor mukshiyam amritaat: (my soul is) like a cucumber bound (to the body), please free me from the captivity of death and give me immortality.